If you have already tried using common ingredients from your kitchen and home to get rid of stains from fingers and fingernails then you should also check this sure-fire remedy which will brighten and whiten your nails in minutes. 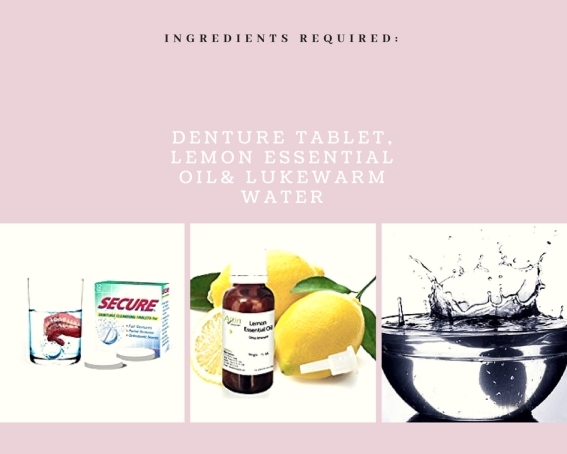 For this you need a denture tablet such as this, 1-2 cups of warm water and few drops of essential oil of your choice. I prefer lemon essential oil such as this. First of all saturate the denture tablet with essential oil. Then take a small bowl and pour lukewarm water in it. Put the denture tablet in it and let it dissolve. Then soak your fingertips in it for 10 minutes. Discard the water after use. However don't use this remedy too often. Using denture solution every now and then can weaken your nails and make them brittle. For keeping your nails clean, white and bright do regular manicure at home and follow these tips for strong and healthy nails. 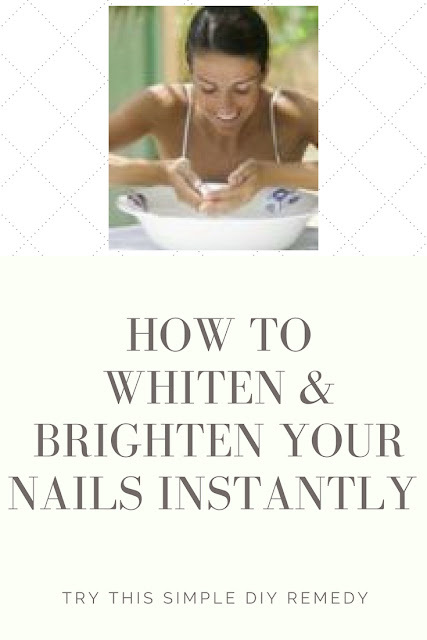 So what do you do to whiten and brighten your nails instantly? And if you did try this remedy, did you find it useful? Do share in your comments. nice one…will try this for sure..
thanks for this, I may give this a test myself. Mix both the ingredients, lemon juice (about 1 tbsp) and baking soda (2-3 tbsp) and make a thick paste. Apply this paste on your nails and with the help of a soft toothbrush just scrub this paste on your nails. Keep it for 10-15 mins on your nails and then just rinse it. Apply a heavy moisturiser on your hands and fingertips to avoid the dryness. Squeeze two lemons in two mini bowls and soak your nails or your fingertips in this lemon juice for approximately 10 mins . Then rinse your hands with lukewarm water and do not forget to apply a heavy moisturiser on your fingertips and hands. White vinegar can also make your nails white and beautiful. You can rub fresh orange peel directly to your nails two to three times daily. And it will start giving a visible result in 1-2 weeks. Use the dried orange peels. Grind dried orange peel and mix it with the little water to make a thick paste. Leave this paste on your fingertips for 10 mins. Use a soft toothbrush and scrub gently. Onion peel will help in making your nails whiter and will also curb the possibility of fungal growth. A diet can also prove to be beneficial for nails. The way your body, skin and hair needs a balanced diet, in the same way, your nails also need a diet for their health. Include more probiotics like yogurt in the diet. Nails are made of up protein, so the richer is your diet in protein, better will be the health of your nails. Eating fish, beef, spinach and dairy products which are high in protein are good for the health of nails and body.